Vladimir Putin has treated Marine Le Pen as if she was already the next president of France, a month before French people vote. The Russian leader met the French anti-EU and far-right politician in the Kremlin on Friday (24 March), an honour that is normally reserved for foreign heads of state or government. 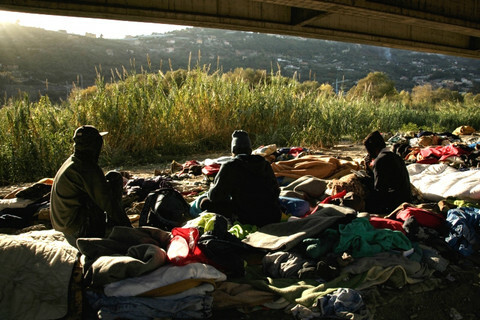 “Of course I know that the election campaign in France is actively developing,” he said. “We do not want to influence events in any way, but we reserve the right to talk to representatives of all the country's political forces”, he said. “I know that you [Le Pen] represent a group of fast-growing European political forces," he added, referring to the increase in support for far-right parties, such as Le Pen’s National Front, in other EU states. 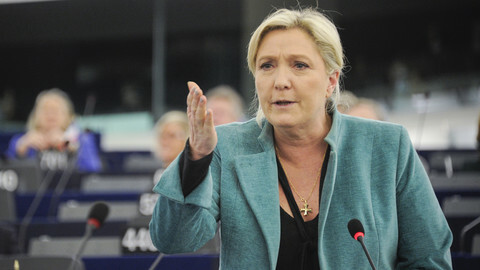 Le Pen, who is polling to win the first round of French presidential elections on 23 April, but to lose the second round on 7 May, mentioned Wednesday’s terrorist atrocity in London to endorse her foreign policy of mending French ties with Russia. “You know what happened a few days ago in Great Britain. I think it would be helpful to share intelligence between our countries,” she said. She rejected the idea that Russia’s help in the French vote came with strings attached. “I’m a totally free woman … I don’t want to be under the yoke of Russia”, she added. 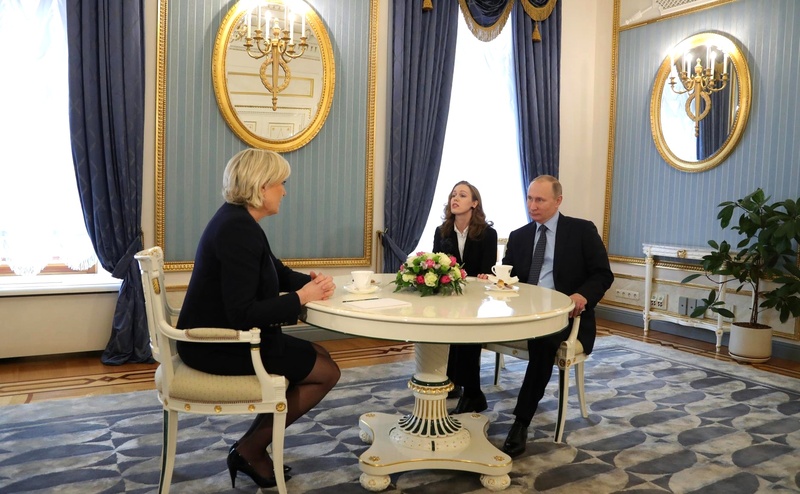 Le Pen has been to Moscow before to talk to MPs, but the Putin meeting was the first of its kind. 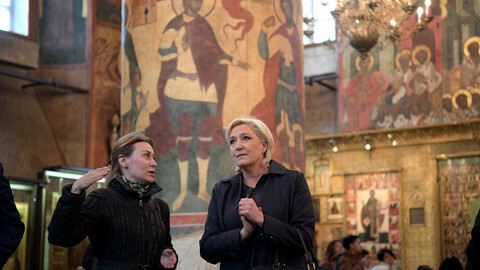 The French politician, who has said she would “liberate” France and “restore its sovereignty” by holding a Brexit-type referendum on leaving the EU, also toured a Kremlin exhibition of France’s past imperial glory under King Louis XIV. Putin, last year, also met with two other pro-Russian French politicians, the centre-right presidential candidate, Francois Fillon, and the centre-right former president Nikolas Sarkozy. But the scandal-tainted Fillon is now tanking in polls, while Sarkozy dropped out of the elections, leaving Le Pen as Russia’s main potential ally. Speaking to EUobserver from Moscow on Friday, Russian opposition leader and former prime minister Mikhail Kasyanov, said Putin’s treatment of Le Pen represented an “outrageous” interference in French national politics. “I was surprised by it,” he said. “Mr Putin has stepped into the French election by inviting her to the Kremlin for the kind of discussion he normally has with foreign leaders,” he said. A news media channel with close ties to the Kremlin, Life.ru, also contradicted Putin’s claim of non-interference by publishing a story on Friday entitled: Moscow helps Le Pen to win election. It pulled down the text a few minutes after it appeared. 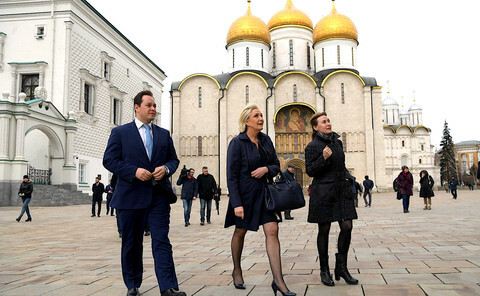 Le Pen’s ties to Russia go beyond political meetings. The French politician, in 2014, admitted to taking a €9 million loan from a bank with links to the Kremlin. Her party treasurer, Wallerand de Saint-Just, said on Friday that she was not asking for more Russian money. The Kremlin spokesman, Dmitry Peskov, also told the Reuters news agency that Putin and Le Pen did not discuss financial aid. Kasyanov said those statements should be taken with a pinch of salt, however. 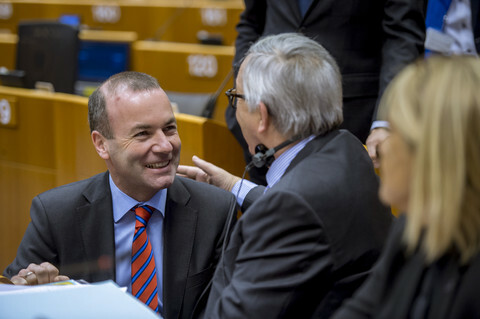 “We could expect such [financial] support again … We can’t believe anyone in this dirty game,” he told EUobserver. Meetings and money aside, Le Pen is also receiving support from Russia’s foreign propaganda machine. RT Francais, a Kremlin-funded news agency, reported on Friday that Russia could help Le Pen to defend French people against terrorists and migrants. 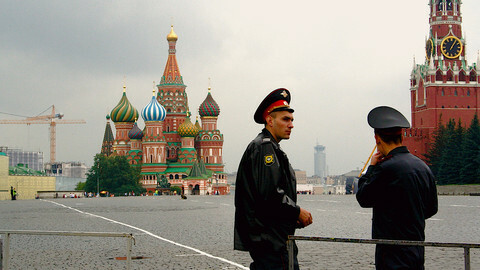 A pro-Kremlin French-language website also endorsed her anti-immigrant rhetoric by publishing a fake story in February that a north African man had attacked a French priest and that French media had hushed it up. Other French-language Russian media sources have spread unsubstantiated claims that Le Pen's pro-EU rival, Emmanuel Macron, had had a gay love affair and that he was controlled either by US banks or by Saudi Arabia. “I expect more anti-Macron campaigns will be coming. The Russian goal is clear - anybody but Macron,” Jakub Janda, an expert on Russian propaganda at the Prague-based think tank, European Values, told EUobserver. “His [Macron’s] campaign says it faces [Russian] efforts to be hacked. French intelligence services say it loud as well … The only question is how much they [Russian efforts] will be able to damage Macron,” Janda said. 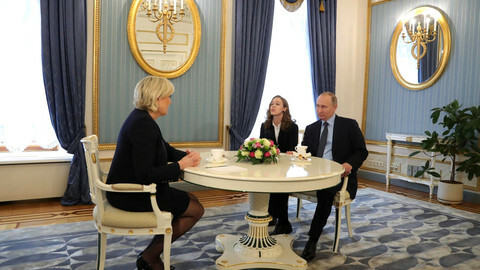 Le Pen, prior to meeting Putin on Friday, went to the Russian parliament’s foreign affairs committee, where she was greeted with blue roses and with kisses and where she said that the EU should drop its sanctions on Russia. She made the unsubstantiated claim that Ukrainian soldiers were targeting civilians in Russia-occupied parts of eastern Ukraine in what she called “a war crime”. She said the US had bullied EU states into imposing sanctions on Russia, but that she had her “own viewpoint on Ukraine, [which was] identical to Russia’s”. Putin’s bombing campaign in Syria did target civilians and hospitals in support of its strategic ally, the Syrian regime, in what EU states and the UN have called war crimes. 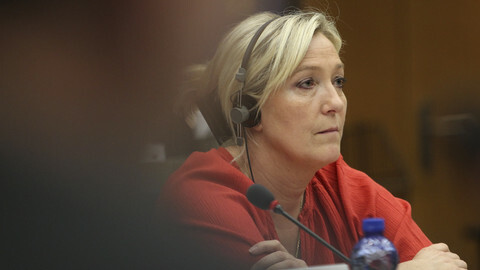 But Le Pen said Putin had helped Europe by striking Muslim extremists in the country. "Fundamentalism is slowly retreating, also thanks to the assistance of Russia, which dealt a heavy blow to it by its intervention in Syria," she said. The Russian foreign minister, Sergei Lavrov, on Thursday also said it was “fictional” to think Russia wanted to interfere in the French vote, before praising Le Pen as a "realist or anti-globalist" figure. Kasyanov told EUobserver that Putin was helping Le Pen, and others like her, such as the German anti-EU and far-right politician Frauke Petry, who is running against chancellor Angela Merkel in elections in September, in order to “divide and weaken” the EU. “The French and German elections are two crucial points this year. His foreign policy will be based on this,” Kasyanov said.